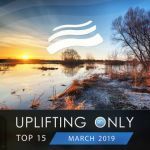 Time for the July edition of the monthly Uplifting Only Top 15 compilation! Again, Ori has personally hand-picked 15 of the very best tracks from recent episodes of his Uplifting Only radioshow/podcast, and here they are! This edition of the monthly compilation features music from illitheas, Maratone, Afternova, Ikerya Project, Nikolauss, DreamLife, Maria Healy, Claire Willis, Mart Sine, Madwave, Syntouch, Angel Falls, Kheiro & Medi, Volmax, AirLab7, Damian Wasse, Carl Daylim, and many more!